One night, about 4 months ago, I had a couple hours of free-time. I was really enjoying the benefits of building apps with .NET Core. But I felt it was still missing all the “built-in” features that makes Laravel (PHP Framework) such a breeze to work with. After all, I just want to build awesome apps and not tinker with the same old boilerplate stuff. What if I just want to schedule my code to run once a week? I don’t want to configure Windows Task Scheduler. Or Cron. I just want to tell my code to schedule itself. Shouldn’t that be easy to do (like with Laravel)? So I set out to learn some .NET Core while building an easy to use scheduler - similar to Laravel’s. Just to challenge myself and see if I could do it. Eventually, “version 1” was completed. To my surprise, David Fowler (.NET Core Architect) responded and the tweet gained way more interactions than I ever thought it would! That was on a Friday. 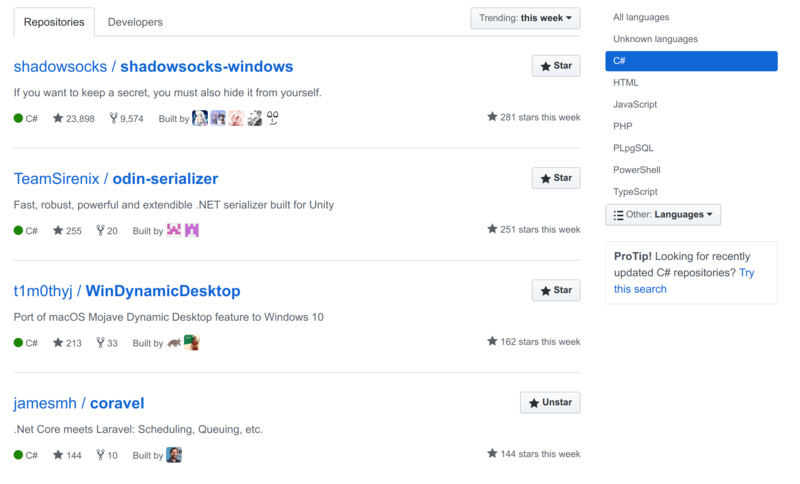 In just two days the Coravel repo became the top #4 trending C# repo on all of GitHub! Wow! I was (and still am) super humbled and surprised! CLI to generate files, etc. When I had the time, I did my best to build them. Today, there are even more features than I had anticipated. Originally, the scheduler was just a fun challenge. But now people were actually using it. So I had to re-write it to be more flexible, more unit tests, thread safety, etc. Throughout this journey, I’ve learned tons - and am still learning each day. I wanted to start documenting some of these things - and give tips to those wanting to build their own .NET based open source projects. I had no experience building NuGet packages. I’ve never done it before. When I had originally built the Mailer feature, it was a separate .NET project that was referenced by the “main” Coravel project. My thinking was that NuGet packages just swallowed any referenced projects and included them. Nuget packages don’t do that. And, it sounds like they never will. The second option does force you to focus on building small modular packages. But one of the driving philosophies behind Coravel is that it should be as easy and possible to get up-and-running. Multiple packages, in my eyes, was straying from this. I chose to go with option 1. I didn’t want to have to maintain more than one package (and all the extra maintenance that comes with it). But what happens when you make the wrong choice? I had comments from people around the idea of not wanting to include the Mailer’s dependencies (MailKit, etc,) when just wanting to use, for example, the scheduler. Fair enough. Since this project is for others to use - it’s important to know how people generally are wanting to use it. But, I’m not fond of having to maintain multiple packages. The technical complexities this would introduce (splitting all the features) is not wanted right now either. So, I decided to go with splitting the Mailer into its own NuGet package. So, I had made the wrong choice in bundling the Mailer into the main Coravel package. Is that a sin? Nope. Did I beat myself up because of it? Nope. As your project grows you discover how people are using your project and adapt. Actively listen to how people want to use your project. For example, I’ve had people mention they don’t like the fact that Coravel is targeting .NET Core and not .NET Standard. Originally, Coravel was designed only for .NET Core apps. One of the main principles was that Coravel needed to just “hook” into the native .NET Core tooling so that it was seamless and super easy to configure. Especially making things hook into the service provider, IHostedService interface, etc. However, slimming of some dependencies (due to some issues posted by others on GitHub) caused me to learn more about how .NET Core works. Due to those changes, switching to .NET Standard might actually make sense now. So I’m looking at investigating this as we speak. And that’s OK. I may have gone the “wrong” route originally. But I’m still learning. It’s OK to learn from your mistakes. That’s how we gain experience. Go back and make it “right”. It’s been 4 months since I started Coravel. Have I been coding every night for 4 hours non-stop? Nope. I’ve got 7 kids. We homeschool. I’m married. I’ve got a full-time job. I’ve got a life. Do I have much free time? Nope. The little bit of free time that I do get has to be allocated to a handful of “important” projects, such as this blog. If I spend time working on this blog then it’s time that I won’t be able to work on other things - like Coravel. It’s a juggling act for me. Probably for you too. Having a long-term vision is what I need to ensure that I don’t get overwhelmed when I don’t get around to doing X for a few weeks. And it’s what you’ll need if you want to build a lasting, useful and robust open source project. Pull-requests take a lot of time. Way more than I had ever expected. I’m super excited that people are interested in contributing to something that I’ve built. But open source doesn’t mean that anyone can change projects to be what they want. I have a vision and philosophy behind everything I create in Coravel. Others can’t read my mind. It’s my job then to make sure all contributions adhere to that vision. This means (for me) addressing what may seem like super insignificant details - one-word changes to documentation, variable naming, etc. But, to me, all the small details matter. It’s what makes Coravel unique. It’s what makes it easy to use. So don’t feel bad when you aren’t just accepting pull-requests right-and-left. It’s still your project. I hope you enjoyed the story behind Coravel so far and some things I’ve learned along the way. I’d like to write another post soon that highlights the technical things I’ve learned - and get into some code!